The purpose of the Alliance's strategic plan is to outline our commitment to success for the electric utility industry's sustainable supply chain. This plan will be used as a communication tool to inform Alliance members, non-member electric utilities, suppliers to the industry, and other key stakeholders about the Alliance's vision, mission and goals. Because the Alliance operates in an ever-changing work where the application of sustainability is evolving, the strategic plan is a living document and will be updated as needed. To be successful in achieving this future state the Alliance must rely upon its membership, Alliance members realize they are making a difference and are energized by their work and ability to use their talents toward a greater purpose. 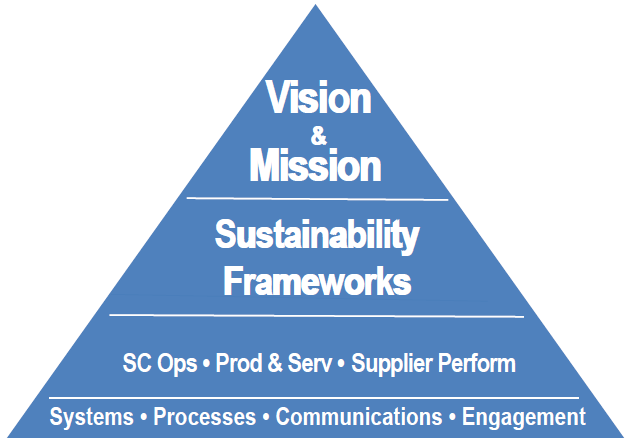 The strategic framework to the left provides the structure under which we operate.